-16 groups and 32 channels to wirelessly control and trigger. -Fully support TTL autoflash. 1/8000s high-speed sync, multi flash, manual flash, flash exposure compensation, TCM transform function, magnification function, one-shoot & multi-shcx)t setting, group modeling lamp control, group zooming, adjusting all groups1 output value simultaneously, etc. -Support Type-C USB firmware upgrade and wireless triggering by 2.5mm sync cord jack. Compatible cameras: Canon EOS cameras (E-TTL II autoflash).Support the cameras that have PC sync socket. [Compatible with Canon EOS series] 1Dx mark II,1Dx,5Ds/5Dsr,5DIV,5D Mark III,5D Mark II,5D,7D Mark II 7D 6D 80D,70D,60D,50D,500D 450D,400D Digital,350D DIGITAL,100D,1200D,1000D,1100D,M5,M3. 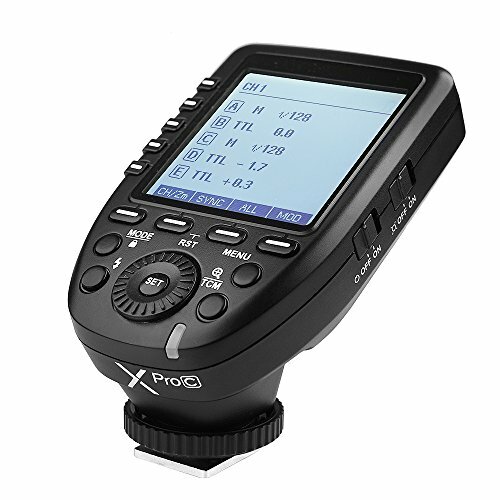 [Versatile Application] Xpro-C TTL Wireless Flash Trigger can not only control the flashes with built-in Godox Wireless X system e.g.camera flashes,outdoor flashes and studio flashes,but also can control the Canon original flashes when using in combination with X1R-C receiver. [Support TTL Autoflash]1/8000s High-Speed Sync, Multi Flash, Manual Flash, Flash Exposure Compensation, TCM Transform Function, Magnfication Function, One-Shoot & Multi- Shoot Setting, Group Modeling Lamp Control, Group Zooming, Adjusting All Groups' Output Value Simultaneously, etc. [Smart TCM Button] Long Press TCM Button can Transform the Flash Value in TTL Mode into the Power Output Value in M Mode; Short Press TCM Button Enables the Groups to be Switched Between the One-Group and Multi-Group Mode. [Large Dot Matrix LCD Panel] 16 Groups and 32 Channels to Wirelessly Control and Trigger. Full Graphic Display of 5 Groups simultaneously.